“Cookies” are small pieces of data that websites can store in a user’s browser. Most modern websites will use some type of cookies and might even require them in order to function properly. An important distinction can be made between session (“temporary”) and persistent cookies. Another relevant type is “third-party cookies”, where the cookies originate from websites other than the one the user is visiting; for example, if there is Youtube or Facebook content embedded in another website, Youtube/Facebook will attempt to set cookies in the browser of the user visiting that website. Unfortunately, cookies may be used in a not-very-benign way. Our security recommendation is to set your browser to reject cookies by default and only allow websites to set first-party cookies when it is actually necessary (in most modern browsers, this can be managed either by the browser’s settings or with the help of browser plugins). Since this is a bilingual site, we place a session cookie to indicate your language choice in order to show you the correct version of the page. This cookie is discarded when you close your browser. A User leaving a comment on our Website may opt-in to save the submitted name, email address and website in the form of cookies. These cookies are optional and for convenience only (so that Users do not need to submit the same information when commenting again) . If not removed by the User or the browser, these cookies persist for one year. When Users that have been granted an account and try to log into this Website, we set a temporary cookie to determine if the browser accepts cookies. This cookie contains no personal data and is discarded when you close your browser. When Users log in, we also set several cookies to save login information and screen-display choices. Login cookies persist for two days or, if the User selects the “Remember Me” option, for two weeks. Screen-option cookies persist for one year. If the User manually signs out of the account, all login and screen-option cookies are removed immediately. If a User edits or publishes an article, we set an additional cookie, which indicates the post ID of the edited article; no personal data is included. This cookie expires after one day. 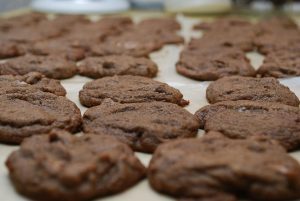 When visiting our office, it is not a requirement to bring freshly-baked cookies, but if you insist, we, hereby, would like to inform you that we are partial to chocolate; this kind of cookie barely lasts the day!